Harley - That Guy with the Birds! Harley was a Harlequin Macaw. Harley was a hybrid, meaning that he has 2 different types of parents. Harley's Mother is a Blue and Gold Macaw and his Father is a Green winged Macaw. Harley hails from Michigan. Sadly, he spent many years of his life living in a dog crate with no perches or toys and very little room to move. Stressful living conditions led Harley to self mutilation. Eating only sunflower seeds, what feathering he had, was ragged and dull in color. Constant screaming and confinement had his "owners" wanting rid of this nasty, UGLY Bird. This is a 5 year transformation. Now Harley is allowed to be what he was created to be...A PARROT! 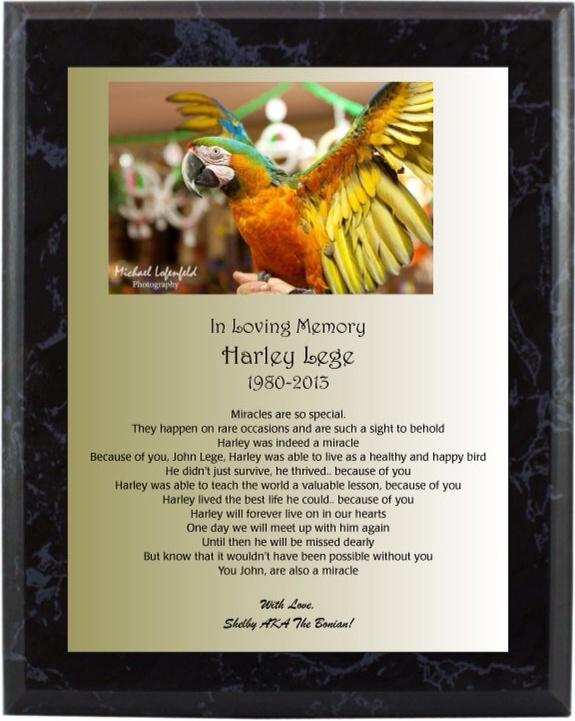 Harley is considered to be my " Signature" Bird, He is what the rescue is all about! Some of you may know that I lost Harley on the way to a Pet Expo. Harley suffered from Aspergillosis - an infection of air sacs and lungs. Harley had 1 dead air sac and his breathing became heavy and labored. Over the last 18 years, he had what I called "Episodes" where he would become weak and have trouble breathing. On September 21 2013 at 2:30 am, Harley went to sleep in my arms with his buddy Jake and the other birds with us. He is now FREE to soar the Heavens. Forever in my heart. Harley 1980-- 2013 FLY HIGH FLY FREE !